There’s a friend of mine who is an old Texas district attorney, a guy who reminds me of Gary Cooper in “High Noon”, the reluctant hero. Of his many speeches and interviews, there was one that has stuck with me longer than the others and I think is well worth remembering. If a man wants to make his contrition and take his punishment, you need to accept it. That doesn’t mean he doesn’t get punished, but you need to let him re-enter society. But if he is not contrite, then God help him–because I won’t. Mr. Tenenbaum made his contrition today in his “Joel Fights Back” trial. He admitted to lying. Under oath. (That’s often called “perjury” and is a crime.) This is remarkable because most of those accused of copyright infringement will tell what they know to be lies, and then continue to stick to their story against all odds. I don’t know what was going through his mind and I wasn’t there, but from the reporting it sounds like he actually did the one thing that he needed to do at this point in his case–he took control away from the Dean of Cyberspace. Joel finally fought back against the circus and shambles of his very public and disastrous brush with the legal geniuses of the copyleft. He fought back and threw himself on the mercy of the court. A bit late, but he did it. Mr. Tenenbaum didn’t fight back enough to throw Nesson under the bus (although Nesson richly deserves it) at least not yet. But it may be that he realized that he had gotten some extraordinarily bad–and publicly awful–advice. Mr. Tenenbaum did the one thing that very few of these people seem to want to do–he admitted he did it and he knew he was lying when he lied. Mr. Tenenbaum made his contrition as best could be expected of anyone who is under the sway of the Nesson–Lessig-Fisher pirate crew. That doesn’t mean he should get off, that doesn’t mean that he should be excused and run home to momma, that doesn’t mean that he should not have to pay the damages the jury awards, that doesn’t mean that he should not have an act of moral turpitude on his record for the rest of his life, but it does mean that his forthrightness should be accepted and he should be forgiven in a moral sense for the future. The past is his own doing and he should be punished for his admitted failures to adhere to societal norms. Humiliating someone for the sake of humiliation is bullying. I think that when the creative community is presented with someone who publicly (and again under oath) accepts the humiliation of admitting that he determined his own fate through the exercise of his own free will after a lot of sturm und drang to the contrary, we need to accept his contrition–and his punishment by the court. It is a huge step forward. I don’t know how many times the Lessig-Nesson-Fisher pirate crew must lose these high profile cases before their followers get the message. If you want to read what whiney reads like, try “How it feels to be sued for $4.5 million” by Mr. Tenenbaum a/k/a defendant. How about how it feels to be ripped off by 45 million? Nesson cuts to the chase: What am I wearing? Another shining moment in stellar legal work from the law school whose name cannot be said. Canada is at the beginning of “consultations” for an overhaul of their copyright law. (“Consultations” are what we in the US might call “field hearings” or “notice of inquiry” type proceedings.) I’m particularly interested in the Canadian music industry as I lived in Montreal and Toronto for over 5 years and worked with some of the top artists in both English and French Canada (many of whom are now iconic Canadian artists). 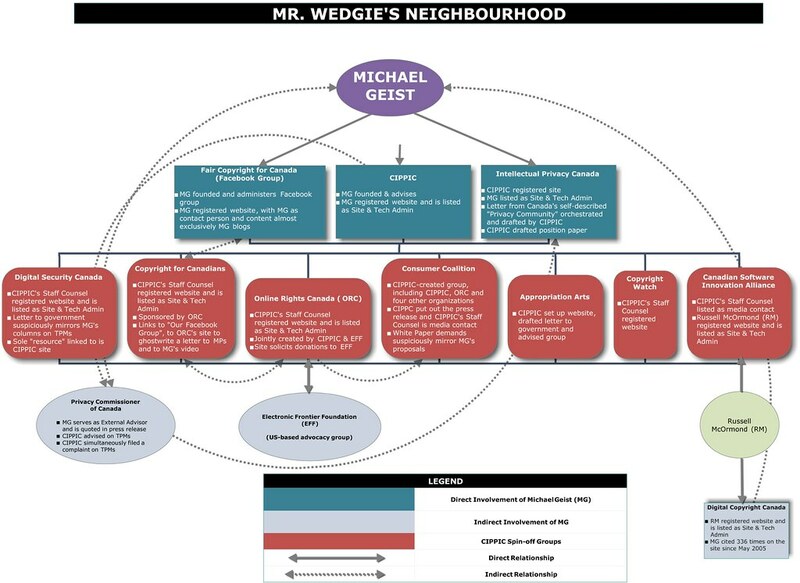 Naturally, the US-backed “free culture” types are coming out of the woodwork to advance the Lessig agenda through their Canadian front groups, and none are greater water carriers for those ideas than Michael Geist, often referred to as the “Canadian [Wannabe] Lessig”. The description is more apt than one might think. For example-Geist continually harps about how he is a proud Canadian and that he looks for a proudly Canadian solution to Canada’s copyright issues—solutions that smack of the very American party line from Lessig, the Electronic Frontier Foundation, Public Knowledge and the other Lessig front groups. It would be interesting to see a side by side comparison of the “solutions” posed by all these groups (also compared to Google’s litigation strategy). Geist’s “Canadian Internet Policy and Public Interest Clinic” appears to be Canadian in name only. The CIPPIC website proudly boasts that its founding was proudly funded by a grant to Geist from Amazon and proudly received further grants from rich Silicon Valley types. Its “external” advisory board includes one EFF, one rich Silicon Valley academic and…big finish…Lester Lawrence Lessig III –well positioned to keep an eye on his boy Geist. 3 out of the 5 are Yanks and the only contributions they talk about are Yankee dollars. Talk about your Uncle Dudley. A dedicated follower of Lessig. Yet–at the outset of these copyright consultations, Geist goes for his reliable wedge politics–Canada shouldn’t yield to outside political pressure. The country that is the source of that political pressure is not named, but those of us who follow Geist know he’s talking about guess who? The Yanks Under the Bed are easy to find this time. Geist should start by looking under his own bed which was paid for with Yankee greenbacks and is well-populated with Yanks. The truth, of course, is that Geist‘s problem is not just with the Yanks-it’s with every country that values its culture and is trying to preserve that culture against the onslaught of the culture de voleur, from Japan to the UK, from Germany to France, even China is beginning to come around. The “access” mantra of the culture de voleur is that they want copyright–but their way, which is copyright “over, under, sideways, down” as little copyright as possible. Their way means a major disruption in the international laws that have allowed artists an opportunity to succeed for generations. Their way always involves a major cutback in artists’ rights and incomes. Their way would give the final kick to the destruction of the economic and human rights of creators and excuse the cruel theft of labor value that is the hallmark of the Internet’s history to date. That is a very apt description of the Internet’s collision with the creative community with the shining exceptions of iTunes, Myspace Music, Hulu and a few others. These exceptions have generated billions in revenue for the creative community, respect rights, negotiate agreements and make payments. And they all started with the premise that artist rights should be respected and paid for. Geist does nothing to advocate a system of property rights that would allow these rights respecting companies and the artists they compensate to flourish–in fact, he spends most of his time looking for Yanks Under the Bed chasing lock pickers. Interesting article from the Vancouver press on the Wedge’s “Fair Copyright” group. When The Leader of the Swedish Pirate Party was on a speaking tour of the Temporary Autonomous Zones known as Google and the Stanford Law School, there was a surprise development. His moderator admonished the gathered pirate fans to contribute to the Pirate Party by handing cash to The Leader. Yes, within yards of the door of the co-founder of “Change Congress”, an ironically old-school political event occurred—wads of cash were pressed into the hands of a politician. Where is Boss Tweed when you need him? But it should be clear that the Pirate Party is not satisfied with staying in Europe. No, they are thinking more broadly. There are three “Resources” listed on the website, the first of which is Professor Lessig’s “Free Culture”, then Chris Anderson/Wikipedia “[Footnote] Free”, and “Against Intellectual Monopoly”. I haven’t read that last one but I have read the first two. If you’re thinking about reading the Pirate Party Manifesto, you can save yourself some time if you’ve read “Free Culture” as the Manifesto essentially regurgitates many Lessigisms same—sorry, remixes same. “Legalization and taxation of marijuana as a revenue source”: would be one—not sure what bongs have to do with net neutrality, dude, but like whatever. Bongs just want to be free. “Socialization of ISPs”: Yes, let’s socialize those ISP before they shut down piracy. “Possession of firearms” and “Right to Self Defense”: Interesting. “Union rights and liberties”: Just not the artist unions, right? “Expiration of Copyright”: Maybe they meant “extinguishment”? And so on. (What happened to online poker?) Perhaps Professor Geist can provide some more links so that those who find a disconnect between drugs, guns and IP can be a bit better educated. I also wonder why the Pirate Party of Canada only mentions Professor Lessig’s book and not Geist’s voluminous writings? Yanks Under The Bed or substantial similarity? However much the Pirate Party wiki sounds like getting costumes and putting on a play in the barn, the desire of demagogues to manipulate the current state of the “file sharing” mob cannot be underestimated. Men on white horses are, of course, not unique to the Lessig movement. But one could also argue that the best news that creators have had in years is that the Pirate Party is now in the legislative light of day wherever they appear so that all may hear their message and judge what they stand for—lawyers, guns, bongs, money and all. There will be little to no anonymity about the Pirate Party’s activities in office. This is not to mention the denial of service attacks and other potential cybercrimes visited upon anyone who sought to bring the Pirate Bay to justice. All denied, all strangely coincidental—and all anonymous. Like most cyberattacks. I wonder if Gerry Adams is envious. Why bomb Harrods when you can bring the Metropolitan Police to its knees with a nice hacker from Bulgaria? We look forward to hearing more about the course that the Pirate Party and its progeny would have the world follow—and their well-reasoned theory about why their anarchy and utopianism should extend solely to intellectual property and not beyond. The Canadian focus on 420, firearms and socializing ISPs may offer a clue. Ah yes. It’s not about the substance, it’s all about the “branding,” isn’t it? I wonder what “branding” Professor Lessig would embrace in the U.S. and his fan Professor Geist would embrace in Canada? The Marijuana Party of Canada, perhaps? Neither Canada nor the European Parliament are Temporary Autonomous Zones as I expect the Pirates will discover soon enough, chronik notwithstanding. They may like to make up their own rules on the Internet, but they will not find national election laws as easy to hide from. What’s going to be interesting to me is how the Pirates (now part of the Green Party coalition in the European Parliament) are going to only vote on “pirate issues”. Are they going to abstain from voting on “non Pirate” issues? And will it be called the Green Pirate coalition? Now there’s an image.